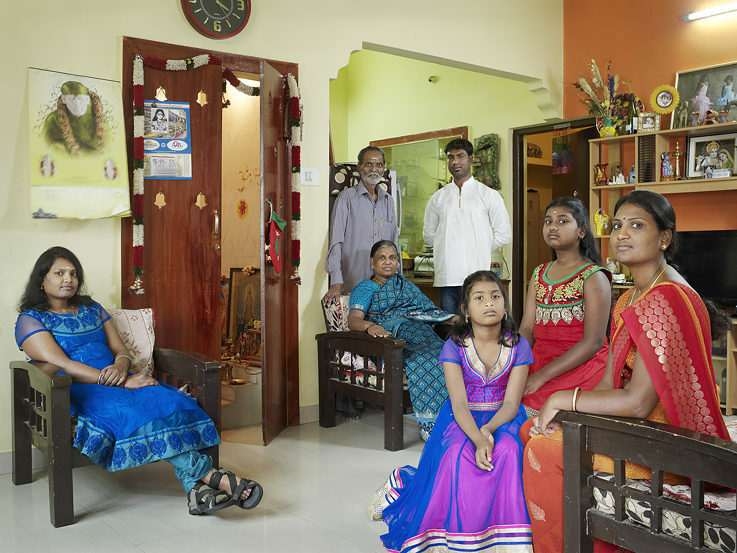 Ms. Bibel, 50 extended families from Bangalore await us in your book. What drew you to this subject? 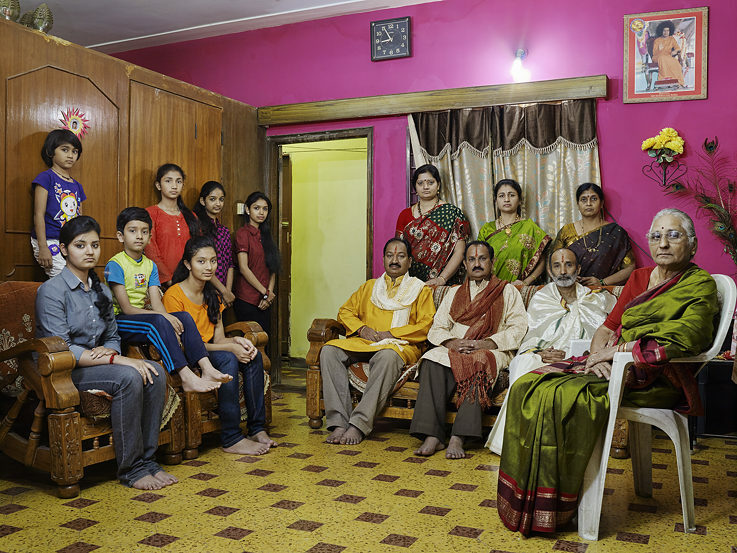 In India, there’s the tradition of the so-called joint family: A couple lives together with their sons, their sons’ wives and children and their children’s children. 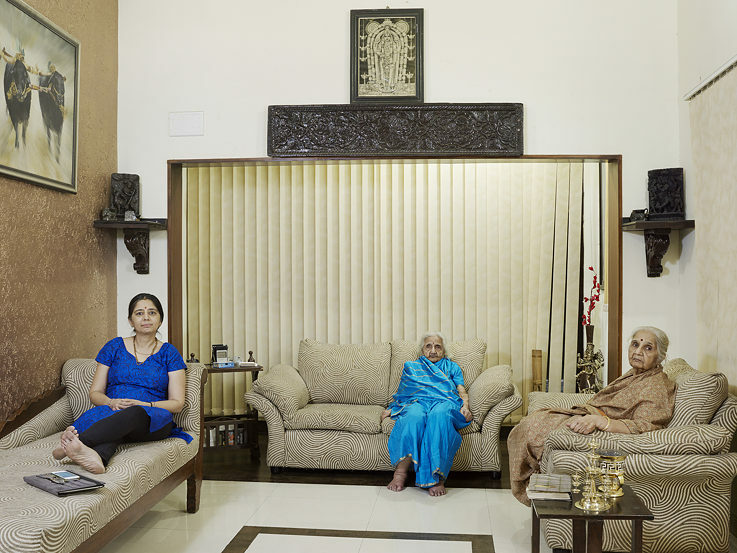 All the members of the family share a kitchen, a communal living room and a bank account. It doesn’t matter how big or small, how wealthy or humble the household is. I was fascinated by this concept, especially since it’s gradually disappearing in cities. Business in Bangalore is heavily influenced by IT and other modern sectors like biochemistry. Standards of living are going up and housing is getting more scarce at the same time. 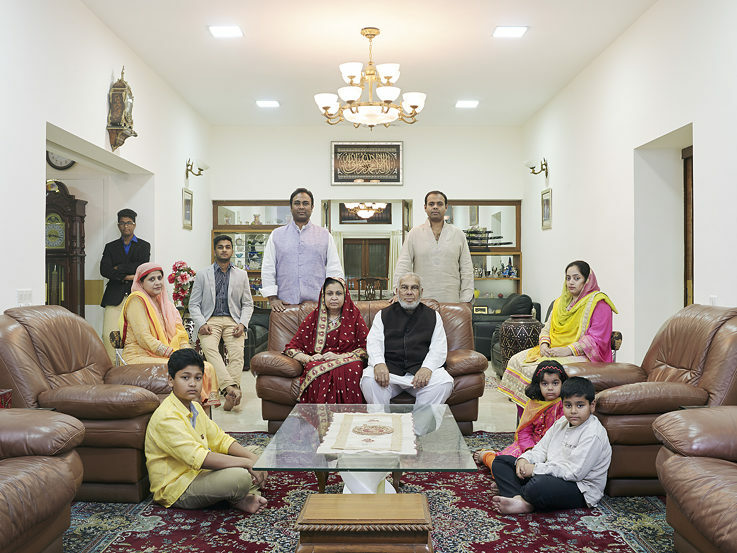 Joint families seem paradoxical in big cities: They’re simultaneously deeply rooted and of a different era. So are you trying to hold onto a dwindling phenomenon in these images? The act of documenting occupies a large space in my work. I’m interested in societal upheaval and what it does to people. But I always make sure not to overexpose anyone. Additionally, it might be difficult for people viewing my photos to guess my own opinion of the concept of a joint family. That’s quite secondary. How did you find the families? 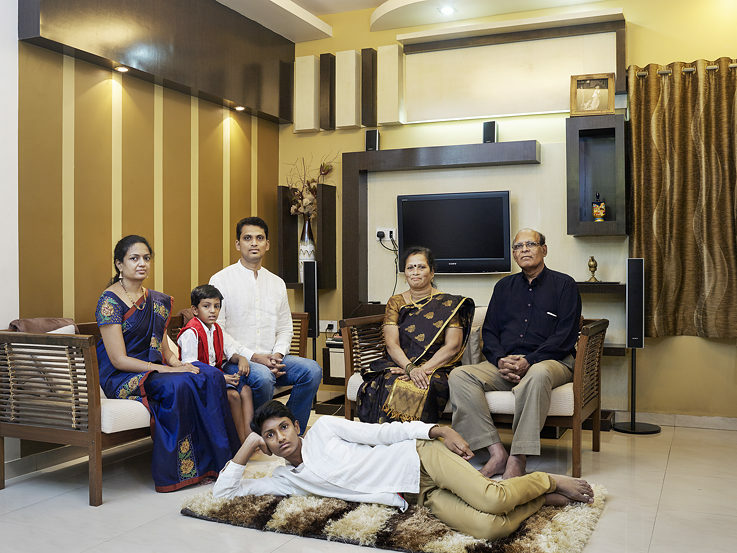 The idea of photographing joint families in their respective living rooms was already at the center of my application to the BangalorREsidency. In this respect, I could begin immediately. My host during the initial part of the Goethe-Institut residency helped me a lot. I also got a ton of contacts directly through the Goethe-Institute. Nevertheless, I quickly realized that I needed to go beyond this network in order to achieve the diversity I desired. 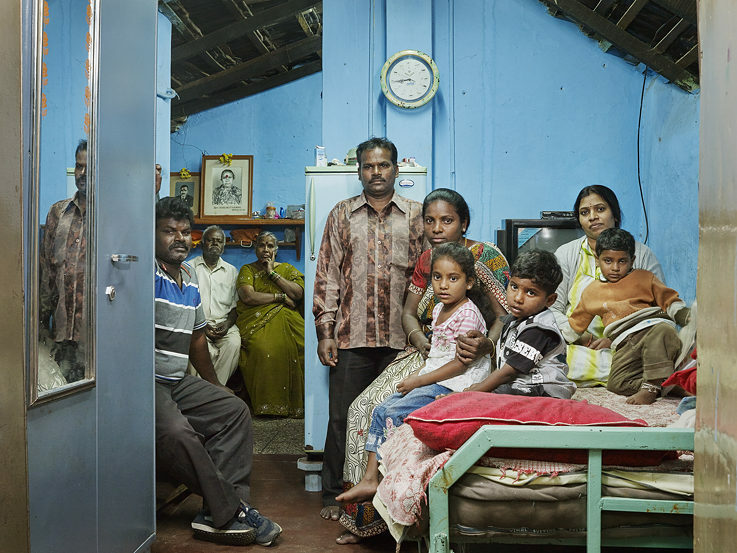 So I walked around Bangalore and asked people if there were any joint families living in the neighborhood. And on top of that, I took out and ad. The next day, my inbox was already full of requests. Did the families expect anything in return? From the outset, I knew that I would compensate them for participating in the project with a photograph. 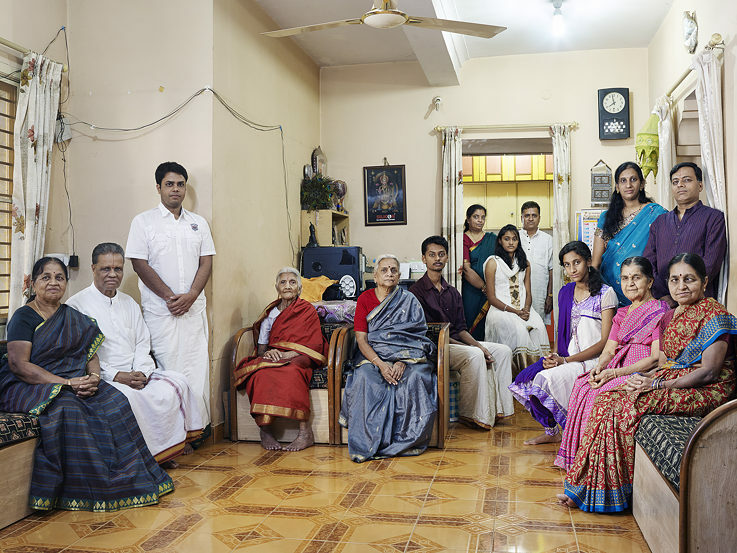 They all thought that was enough, because joint families are proud of their tradition and enjoy showing it. You should have been there! At times the noise was deafening. Hardly any of the participants reckoned that a sitting could take up to an hour. My decision to use long exposure times – based on historical portrait photography – made things all the more difficult. But ultimately we always succeeded in getting everyone to look in the camera without blinking at the crucial moment. Except for a few children. But it doesn’t bother me at all that there’s a bit of motion blurring on their faces. It accentuates them. Looking directly into the camera – was that what you wanted? Yes, I asked the families to look directly at me and to relax. I didn’t want them to have tense smiles like you see in wedding photos. In this way, many people who view my images feel like they’re in the middle of the room with dozens of pairs of eyes fixated on them. 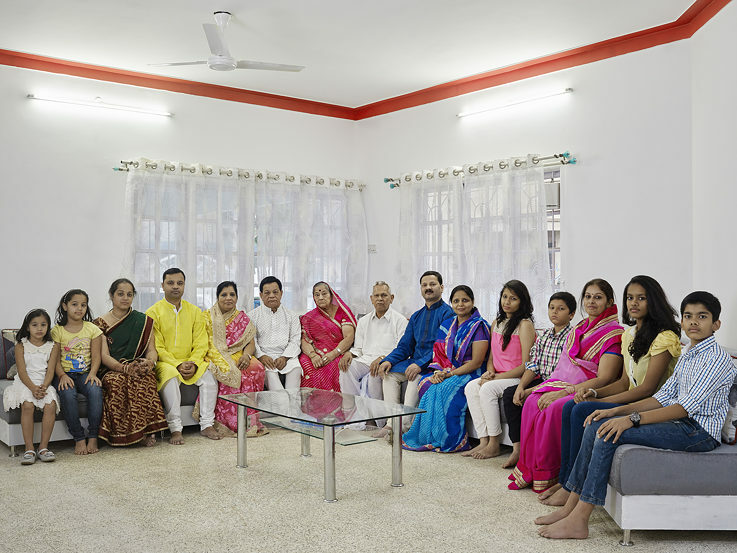 And who decided which members of the family would sit and which would stand? In the beginning, the families positioned themselves the way they wanted. But it was important to me to illustrate the relationships between family members. So I took over the arrangements. Sometimes I needed to be persuasive. Also when it came to lighting and field of view, I had to assert myself at first. Men tend to want to show women how things work. Especially in India. Nora Bibel was born in Munich in 1971. She discovered her passion for photography in an intensive course in high school. She then studied photography at the University of Applied Sciences in Bielefeld and spent an exchange year in Australia. She went to Moscow for her thesis project. Her series of portraits and cityscapes – submitted in 1999 – already demonstrated her eye for societies in upheaval. Nora Bibel lives in Berlin and works as a freelance photographer and is a professor there at the HMKW University of Applied Sciences there. Hendrik Werner writes texts for companies and institutions, he designs publication concepts and gives seminars on professional writing.